Gary Gorski has put years of continual work into Draft Day Sports: College Basketball, and has seen incremental progress along the way. It’s been awhile since I reviewed a game. Often, life gets in the way. Adulting happens. If you’re like me, your ability to play games becomes somewhat scarce. As a result, your collection of games may shrink as well. Therefore, you may become more critical about the games you choose. This is true of any genre. In the last decade, the prevailing thought in the sim gaming community was that this would not be a problem, because there would be so few games to choose from, you’d take what there was. But with a bevy of baseball options, the release of FOF8 (and the partnership with OOTP) and the continued improvement of the Draft Day Sports: Pro and College Football series, and even hockey games starting to take hold across the board, we’ve long been in a golden era of sim games. This is absolutely true when it comes to the basketball market. HeavyReign’s Fast Break series is one that has stood the test of time. It was a solid, immersive game where you feel like your input comes with consequences. This is especially true in the college game, and it deserves it’s place among the superb titles available for users. Gary Gorski has put years of continual work into Draft Day Sports: College Basketball, and has seen incremental progress along the way. The two games, however, appealed to different markets. In many ways, they still do. This is a credit to what HeavyReign has built with FBCB, that it has taken this long. But the time has come. To veterans of the series, the UI remains generally the same. It’s clean and generally easy to navigate. 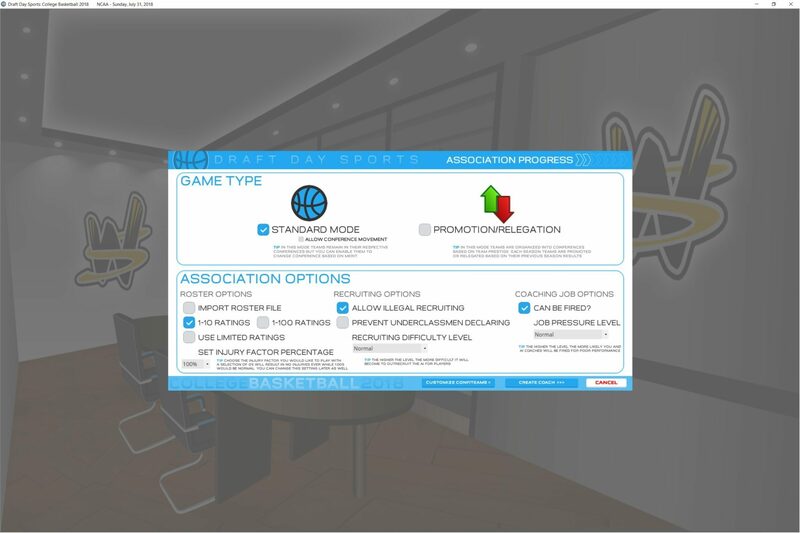 There are menus on each side of the screen, with shortcuts at the top and bottom, association-specific material on the left, and team-specific information on the right. You’ll find your conference mates towards the top, along with direct links to association-specific material at the very top of the screen. The fonts are sharp, the screen bright and the color choices for the menus wise. To a new user, this can be overwhelming at first; however, while there is a steep learning curve with all games in this genre, due to the detail-oriented nature of the games themselves, the Wolverine style is consistent among all of its games, and pretty easy to understand (once you get over the initial feeling out process). That said, I still have a complaint, one that I think serves as a bigger issue than in years past. We live in a current climate of increasing resolutions and monitor sizes. However, windowization—the ability to play the game, and any Wolverine game, really, in a windowed setting—is still impossible. At the very least, I cannot do it on my Surface Pro 4. Now, you can window the screen (and it is suggested to do this as soon as the game opens). However, the game does not adjust to the windowed setting. This may seem like a trivial complaint; realistically, though, consider that my computing experience usually has Chrome taking up half of the screen, and Spotify, Word, and a bevy of other programs and games taking up the other half. Out of the Park, a game for which I have beta tested for several years, is one of these games. It has far more information to display, as well as multiple in-game screens. Yet, it windows flawlessly. One can say that OOTP has more support than Wolverine, but I think I’m past the point where I buy that argument. The full screen Wolverine games, at least on my screen, leave a lot of dead real estate (about half of the screen is not usable), and it kills my productivity. Okay, so alt-tabbing is a first world problem; I still think my point is valid, and has been for a few years now. The usual fare is here, which is fine. You can play in two formats: as a regular league, or in promotion-relegation, which sets up sixteen-team conferences throughout the nation. 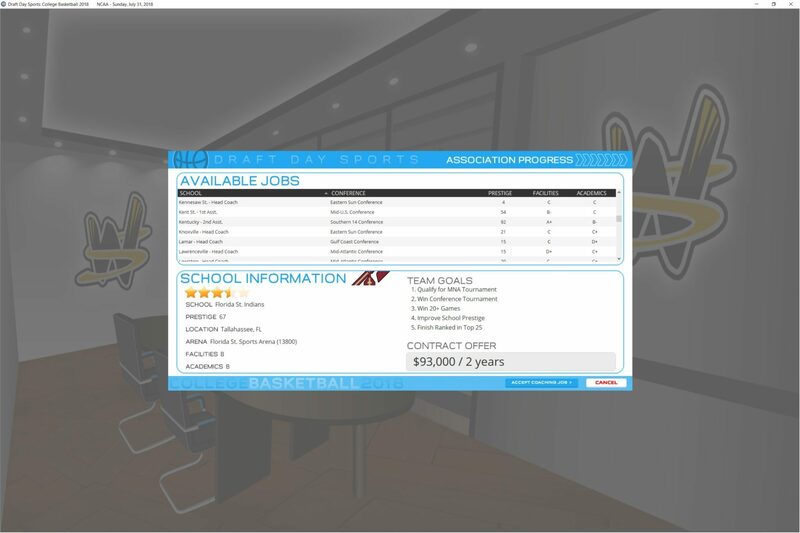 The game does not ship with the actual school and conference names; however, these are easily changed with a mod, or by doing it yourself (though this can be a tedious process, as it is in any game). There is also the usual Wolverine fare, allowing you to edit tournament names (suggestion: I would love the ability to turn off some tournaments), ratings selections (as well as importing a roster file), even allowing for illegal recruiting and upping the job pressure levels. You can also do something that has always been my favorite, and prevent underclassmen from declaring. 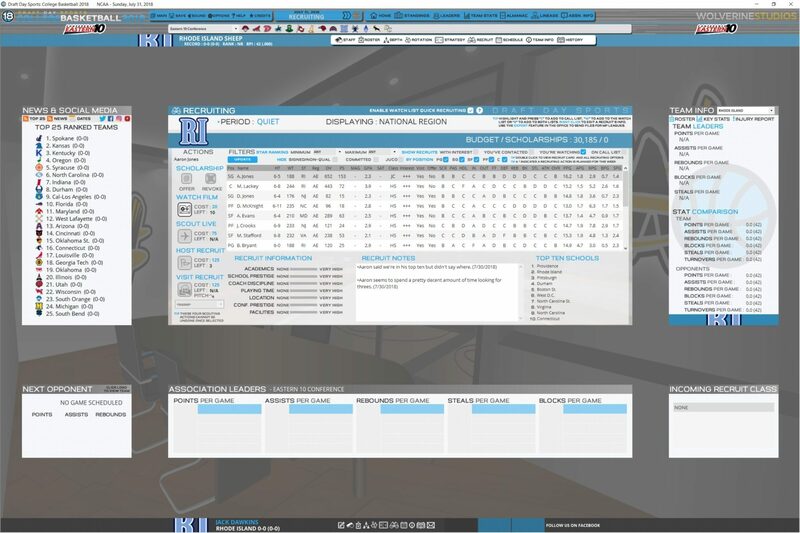 You can adjust team names, conference names, logos, uniform colors, etc. Additionally, and this is an improving feature…you do not have to take over as a head coach. The ability to be an assistant has been in DDSCB for a few versions now. In DDSCB18, there are some improvements to this feature. Now, there is the ability to hire assistants from other programs, even while they are employed. This can also happen to you, if you’re not careful. This is in line with real life (something we know all too well). I think it’s time for Wolverine to add something, and I’m going to hold it to the Fast Break series when I call for customized leagues. I do believe there is a wish to play historical with college hoops. In fact, I know this to be true with the Fast Break community. 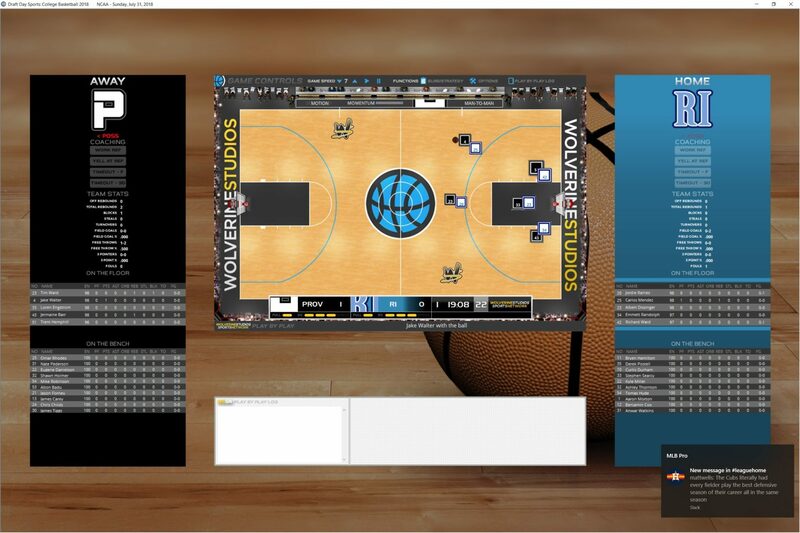 One of the most rewarding experiences I have had as an online player comes from the NCAA53 league, a FBCB league that has mirrored historical changes to schools and conferences. It’s a big undertaking for the league’s commissioner, but it’s one that has an enriching feel that other leagues cannot match. Other customized files have been made to allow users to begin at various points in the history of the NCAA. For instance, one was created with the historical landscape at the advent of the Big East. (That’s my personal favorite, but I’m also biased towards the Big East). DDSCB does exactly what it sets out to do, and it does it very well. And I think the promotion-relegation feature, which FBCB does not have, is unique and rather fun to play. However, the game has been at this point for a couple of versions, and is quite stable with these formats. I believe the next version is the right time for Gorski to implement a few historical scenarios, to allow for varied play. It is certainly feasible, and would add dimensions to the game that pro/rel cannot. This is where the game shines. You can coach in DDSCB, and feel like your changes have a tangible impact on the game. The game plays authentically, and will react to your coaching. The players will react to your personality (at least, the one you portray in the game). That’s a testament to what makes Wolverine games last. Gary Gorski has remained committed to playing a realistic game of basketball, and to creating an environment where one can run a collegiate basketball program, and allow reality to be suspended throughout the process. In DDSCB18, there have been several improvements to this end of the game. The big one for me is the endgame. I’ll be honest; I think the endgame logic in virtually every game is terrible. Now, this needs context; we all know that we’re dealing with algorithms and these are programs trying to replicate something that his human. However, for context, Notre Dame just won the NCAA Women’s title on two amazing shots at the buzzer. No game has, to this point, been able to replicate that on a consistent basis. I have had buzzer-beaters and the like, and those are fun (or agonizing and terrible and how-dare-they, depending on the situation). However, those have often been in the minority over the duration of my playing experience. So many times, I have had a puzzled look on my face, wondering what in the world my team was doing in the game’s final fifteen seconds. (This is also a limitation of play-by-play, which I understand). Gorski has specifically attacked this part of the game, looking at situational basketball and making it a priority. If a team is down more than one possession in the waning seconds of a game, you’ll see a more rushed, frantic offense. Now, this comes with a double-edged sword, and will likely require further tweaking. For instance, if you’re down three with twelve seconds left, will your team automatically come down and chuck from 28 feet? Or will they try to drive to the basket and either draw a foul (or a three-point play) or try to extend the game by scoring and sending the other team to the line, attempting to use the gravity of the moment to force nerves? Or will they drive and kick? I have not had sufficient ability to test this, so I cannot speak to the game swinging the other way. My hope is that Gorski continues to build upon what he has started, and the result is a robust endgame engine that takes these things into account, and will really open up your ability to coach in the clutch. It does need noting, and I guess this is as good a place as any, what I normally note at this juncture. The major contributors to making this community what it is—OOTP, FOF, Wolverine—are incredibly responsive to the community. OOTP had a patch out within 24 hours of release of OOTP19. FOF takes a more measured approach, but their patches are usually all-encompassing. Wolverine is no slouch in this department, as Gary (and Brooks Piggott, developer of the college and pro football games under the Wolverine umbrella) are consistently taking feedback and pumping out patches and additions to their games. DDSCB and PB are never finished products, and that’s a good thing. This isn’t really where Wolverine hangs its hat, which…okay. DDSCB (and PB) is designed to be more of a solo venture than a shared one. This is reflected in the game’s design. And that, I understand to a point. Basketball has been a tougher online nut to crack than baseball or football. Basketball leagues are like indie bands, as is their following; they are niche, and the community smaller…but more fierce and loyal. Basketball, I find, is way more of a nerd community than baseball or football; this holds true in the nerd sim gaming collective, too. It’s a niche within a niche. As a result, Wolverine made the decision to have online modes, but it’s pretty stripped down. This can lead to some cumbersome play when you do set up a league. Personally, I’m more pleased with the improvements under the hood Wolverine made to the game, and if the online component took a back seat, okay. I will say…one thing I would absolutely love, and it may be an impossible thing to accomplish, but I’d love to see head-to-head here. I won’t profess to know the specifics of what such an endeavor would involve, but I’ll just say that I think it’s the one feature that could really elevate the visibility of the game (and Wolverine). In the end, you get an immersive, intuitive basketball game that plays out a strategic brand of ball on which you can put a personal stamp. Build a program up. Burn it down. Run it with integrity. Try to sleeze your way to the top. Whatever you do, remember…you’re the one doing it. And that’s the best thing about this game. It doesn’t feel like it’s some code. There isn’t a cheat code (you know, outside of bribery). Your choices direct your path. In this genre, I can offer no better compliment. Wolverine’s competition has stayed moderately ahead of Wolverine over the years. Granted, that’s a fun game, too, one that will reach a different audience. (One drawback of Wolverine games: simming out a history is very cumbersome. With FBCB, you can play out a season very quickly. In my 900+ page dynasty I am (still) writing, I have played out a 50+ year history. If it were difficult, I would not have written the thing. And yes, you can build a team with FBCB (less so with FBPB, honestly). It has long been the gold standard for the college basketball genre. With this version, though…it is looking up at a game that continues to get better with every version, one that adds layers upon layers, and draws you in as well as any game on the market (and moreso than FBCB does). Yes, you’ll spend more time dealing with the intricacies of your program. Yes, this is a more time-intensive game. But it is exponentially more immersive than any game on the market. It is worth your investments…both financially, and with your time. This is what we’ve been waiting for, from a college basketball standpoint. And from a franchise that wants to get better. You’re not just signing up for a game with your purchase, You are entering into a relationship with a company that is listening…and acting on what they hear. While we are seemingly in a golden era of sim sports game, the community as a whole continues to struggle. Wolverine deserves your attention, as well as your investment. DDSCB (and, as you’ll see in two weeks, or now if those two weeks have passed, DDSPB) is a great chance to get on board and find out why that is. As it stands now, it plays basketball damn well. That’s why you’re buying it. In terms of the player-centric experience, it’s superb. A coach of a collegiate basketball program, the game is top notch. DDSCB has online mode, but there are flaws. That said, the lack of ability to window the game is becoming a detriment at this point. It’s intuitive, though it does require a familiarization process.